Creating a dynamic and captivating focal point without taking up valuable floor space is a breeze with the lightweight Light Hanging Slate Wall Fountain with Copper Patina Trim. It combines genuine multi-color Indian Rajah Slate with a unique copper vein frame. Water flows down the tapered surface passed polished river rock creating a soothing sound and awesome focal point for any room. Engineered with Bluworld’s splash-free design and featuring the new *NSI™ Slate, this water feature arrives to you completely assembled. * NSI Slate™ – Water fountains made with our NSI™ Slate use our patent pending technology which sheers a layer of genuine Indian Raja Slate and fuses it to composite material with the same chipped edge technique as slab slate. They are indistinguishable from a thick slab of slate. 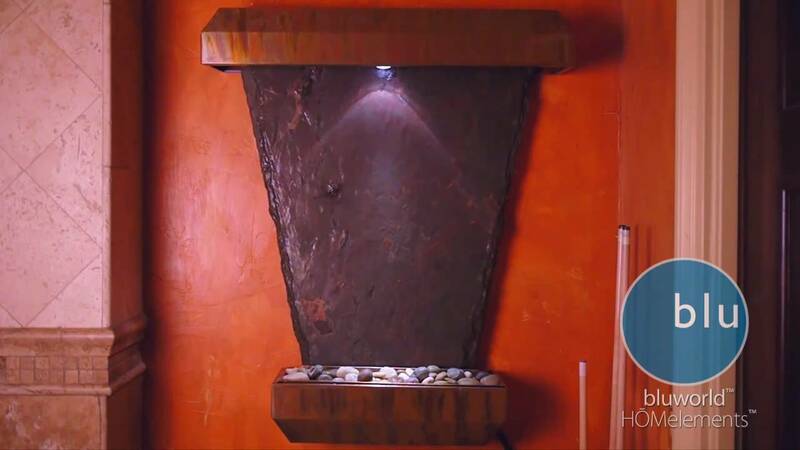 All the beauty is retained and the weight is reduced by over 90% making it easier to hang a wall fountain.